Arizona Sen. John McCain (L) and Samuel "Joe the Plumber" Wurzelbacher during happier times at an October campaign rally in Elyria, Ohio. 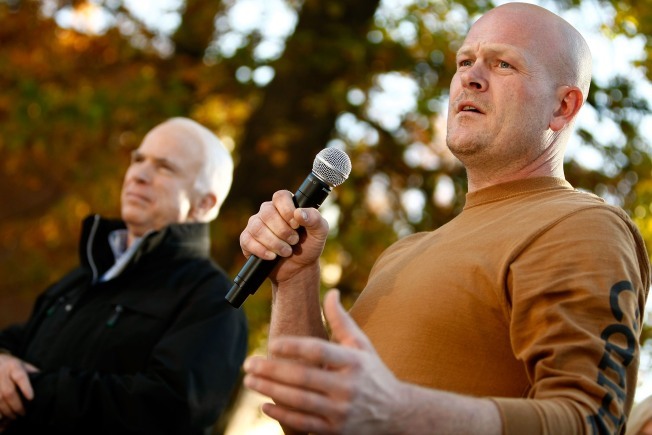 Turns out that "Joe the Plumber" isn't a big fan of John McCain after all. America's most famous unlicensed plumber says McCain's reasons for supporting the government's $700 billion bank rescue plan left him appalled. Samuel "Joe the Plumber" Wurzelbacher told conservative radio host Glenn Beck that it nearly caused him to leave the Republican presidential candidate behind on the campaign trail. The opinionated Ohioan who became a household name in the final weeks of the presidential campaign, said he was angry and asked McCain why he voted for the bailout. Wurzelbacher said some of the Arizona senator's answers stunned him. However, he didn't say exactly what set him off, hinting, of course, that more detail would be in his book –– due this month.